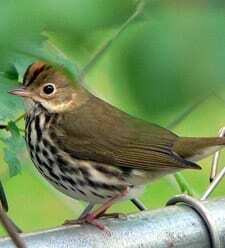 The Ovenbird’s rapid-fire teacher-teacher-teacher song rings out in summer hardwood forests from the Mid-Atlantic states to northeastern British Columbia. It’s so loud that it may come as a surprise to find this inconspicuous warbler strutting like a tiny chicken across the dim forest floor. Its olive-brown back and spotted breast are excellent disguise as it gleans invertebrates from the leaf litter. Its nest, a leaf-covered dome resembling an old-fashioned outdoor oven, gives the Ovenbird its name.